The Sabbath is a gift from God which is being stolen from mankind by religion and society. Society and religion are stealing God’s gift of the weekly Sabbath from mankind.The most precious commodity we have is time. Houses can be rebuilt. Food is regrown. The air we breathe is recycled by the plants around us. Even the water we drink evaporates up, falls from the heavens, and filters back down into the aquifers to be reused again. But, once time is spent, it cannot be reclaimed. Time is a consumable commodity which can never be regained once it has slipped through one’s fingers. Those precious moments between mother and daughter or father and son pass away into memories the instant the moment is past. We spend most of our lives preparing for work, working, and then being exhausted from work. Every moment we spend engaged in the work cycle just described is a moment we are missing with our loved ones. It is a moment we are not spending doing something we truly want to do. It is a missed moment by a mother to be playing on the floor with her baby. It is a missed moment of a father fishing with his son. It is a missed moment of big brother playing ball with his younger sibling. It is a special heartfelt conversation over coffee missed between sisters. It is a moment when a little girl is not polishing her dad’s fingernails because he is too busy or too tired. It is a missed moment of uninterrupted intimate connectivity with God. Of course, work is necessary. The Bible tells us we must work (Gen 3:19 Pro 12:11 2Th 3:10). However, God also knows we need rest. Therefore, He tells us in the Bible when to work and when to rest ( Exo 23:12 Exo 31:15 Exo 34:21 Deu 5:13). God set aside a special time for us to rest ( Gen 2:2). He did this at creation as an example for us. However, society tells us there was no creation. The world says we evolved. Therefore, creation is a myth and so is the Sabbath. In fact, the world is telling us more and more there is no God. The secular world says work hard and play harder. There is no time to rest. Is that true? 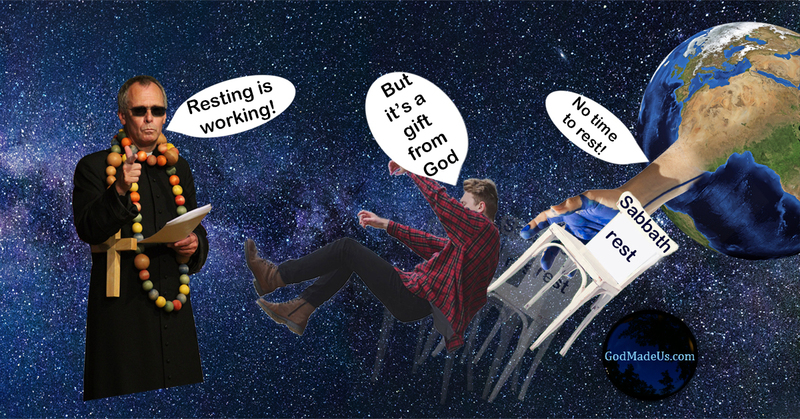 Do we not need rest? How many of us have ever gone on a vacation and returned feeling more tired than when we left? How many of us have ever played so hard during our supposed time of rest that we needed to recover afterward? This physical body each of us wears requires rest. The world says get up, dust yourself off, and go again. You don't need any rest. Got no time for that! If that were not bad enough, Christian pastors often side with the world concerning the Sabbath. Religious leaders within the body of Christ frequently condemn those of us who enjoy the Sabbath. Col 2:16 tells us not to let anyone do this to us. Christian pastors tell us if we rest on the Sabbath as God showed us to do, we are actually working for our salvation. Think about that. The clergy says by resting, we are working. One must think long and hard to come up with logic like that. People only come up with logic like that when they are trying to justify some sort of prejudice or bias which they know in their heart is wrong. They tell us the Sabbath was done away with at the cross. Did Christ do away with the fact we get tired when He allowed Himself to be crucified for us? Do we no longer feel exhausted after working all week? Are we now rejuvenated by the absence of rest? They say Christ is our rest. There is some truth in that statement. In fact, there is just enough truth in that statement to be able to use it to mislead the masses. Like the saying goes, “the best lie contains a little bit of truth.” Like the other commandments of God, there is a spiritual meaning as well as a physical practicality to the fourth commandment. Christ becoming the sacrifice for our sins certainly gives us a spiritual rest, but we are also still physically tired after working six days in a row. Our LORD’s sacrifice did not change our physical bodies into some sort of rest resistant robot. That La-Z-Boy recliner still feels pretty good at the end of the day. Christian pastors tell us “the Sabbath was for the Jews.” Do Christians not get tired? Are Jews the only people who get tired? Imagine what kind of world that would be where only Jewish people got tired. Every boss would be saying, “Don’t hire any Jews. They have to rest every seventh day. Hire them Christians. Jesus is their rest. He already rested for them. They can work every day.” In that world, Christians would be in high demand all over the globe. Are we in high demand? We need rest exactly like all the other people God created. Some religious leaders agree we need to rest, but they disagree about when we should rest. Some Christian pastors say we can rest any day: one in seven. Some say to rest on the first day: Sunday. Rest, then go work or play for six days. This sounds like a secular salesman. Get your Sabbath rest now. Get it now on credit. Worry about that nasty work thing later. Instant gratification is the name of this game! Many Muslims say rest on the sixth day: Friday. The Word of God says rest on the Seventh day. If God has a team, satan has a team, the false prophet has a team, and man has a team, and I need to choose a team, I am running as fast as I can to join God’s team. I’m jumping on board the seventh day Sabbath soul train because I already know who wins. Isaiah Isa 66:23 tells us when God makes the new heaven and the new earth that “all flesh”, it says “all flesh” will come to worship God on His Sabbath. It does not say some will worship on the first day and some will worship on the sixth day. No, the Word of God says we will all worship on the Sabbath which it also tells us is the seventh day. God gave each of us this precious gift of the Sabbath. This is a special gift He gives us week after week not because we earn it, but because He loves us. He gives us this gift every week because He knows we need it. After all, He created us. So, He knows what we need to keep this physical body healthy. He knows we need this time for physical and spiritual rejuvenation. There is no excuse for not spending a full day with God every week because He gave us the Sabbath for this purpose. If we don’t have time to spend with God, it is because we have allowed the world or religion to steal this gift of rest time from us. We must claim the gift God has given to everyone, everywhere: the seventh day Sabbath.